He took His first breath of our flawed air in a borrowed stable. There was no room left to give Him. The crowds gathered in the town were carrying on with their responsibilities as always, unaware that the Savior they’d been waiting for was here. Did the wind know? Did it sing along with the music of the Messiah’s newborn cries? Did it whisper He’s here! to the trees? Did they sway with the wind, in praise of their Creator, Who had come to earth? 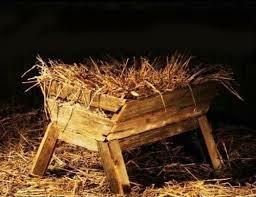 Did the animals know that their Master was among them, sleeping in their manger? Heaven knew. Their precious Jesus had left them for a time. God’s Son, the treasure of heaven and earth, had left glory to go to a people that gave Him their leftovers. The innkeeper gets a bad rap sometimes. I’ve condemned him several times in my soul. He seriously had no more rooms? Couldn’t he have made room for the King of Kings? But He didn’t know that the Lord was close at hand that night. And here’s the thing about us. We do know that the Lord is close at hand, and we still give Him our leftovers. We give Him our leftover time (if any’s left), our leftover efforts, our leftover money and resources, even our leftover worship. He knew this was how we’d be. He knew what we’d do. He knew what it would take to save us, and yet He still came that night two thousand years ago as a Baby to sleep in a manger, on a borrowed bed of hay. He came, knowing that He would die for us. Some thirty-three years later, He would borrow another resting place after His death on the cross. He was placed in a borrowed tomb. For three days. When Mary Magdalene came to the tomb on the third day, she found it empty. “11 Now Mary stood outside the tomb crying. As she wept, she bent over to look into the tomb 12 and saw two angels in white, seated where Jesus’ body had been, one at the head and the other at the foot. He took His first breath as the Risen Lord in a borrowed tomb. There was no grave that could hold Him. The followers and accusers alike were carrying on with their responsibilities as always, either in sadness or false triumph, unaware that the Savior they’d seen crucified was here, living and breathing again. Did the wind know? Did it sing along with the music of Mary’s cries? I have seen the Lord! Did it whisper He’s alive! to the trees? Did they raise their branches and leaves with the wind, in praise of their Creator, Who had risen from the dead? Did creation know that Jesus had defeated death and walked among it once again? Heaven knew. I’m sure the angels were rejoicing with a thunderous roar when their treasured King breathed life again and defeated the enemy once and for all. Do you know He’s alive? Do you know the Lord is close at hand? Does He have your first fruits or your leftovers? You see, He left the glory and wonder of His home, of heaven. He left to come and be near to us, with all of our shortcomings and failures. He came for us, so that we could be with Him in heaven some day. Thank you, Jesus, for being near to me. This entry was posted in Devotionals, Music and Songwriting and tagged Away In A Manger, Jesus and Heaven, Jesus born in a manger, Jesus born in a stable, Jesus in the borrowed tomb, Jesus raised to life, Jesus' birth, Jesus' life and death, Mary Magdalene and Jesus. Bookmark the permalink. You are such a great writer Paige. Very thought provoking! YES!!! YES!!! The wind knew, the earth knew God had come to earth!!! Oh how I want to be a part of the choir!! Thank you for what you share because it helps me do just that! Love you girl! I agree — you are a great writer and have such a unique way of looking at scripture and I believe that is God working through you. Thank you for allowing Him to use you! Yes! I’m with Connie, I want to be a part of the choir! Your words inspire me to give Him my all! Visiting from Holley’s. Beautiful post, Paige. Longing to be part of the choir. Me, too. You know, we can be part of that choir now! We can “sing” to Him by worshiping Him with our lives!!!! Thank you so much for visiting. I believe everything on earth knew, except people. We know now! Beautifully written. My goal this Advent is to give Him more of me and not my leftovers. Your questions reminded me of one of my favourite songs (OK, I have a very long list of favourite songs) – Sandi Patty “Was It a Morning Like This”. Great post to help us contemplate the Christmas season and the birth of our Saviour. Yes! I know that song! My sister used to sing it at Easter. :) Thanks for reading!